It's time to head out and Surf! A little lingo before you head out! If you hear this while in the water, watch out, you're about to interfere with a surfing dog! 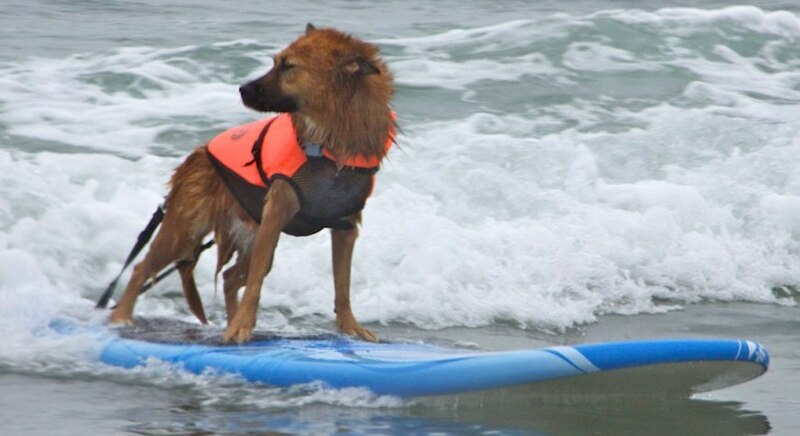 Surf Dog Retriever. This a friend or family member who is helping you in the water. They are helping to watch out for the safety of your Surf Dog and helping you retrieve them when they jump off or wipeout. They will also help to get them turned around and heading back out to you. If you’re not a Surfer and or are not familiar with surf Etiquette, please read and become familiar with Chapter 15, Surf Etiquette. These are un-written rules that apply to surfers, but can and should also apply to Surfing Dogs and their Owners. For the first couple of weeks, you’re going to be surfing in the soup on the inside. Do not attempt to go outside until both you and your surf dog have mastered surfing in the soup! Before you start, put on and secure their CFD. 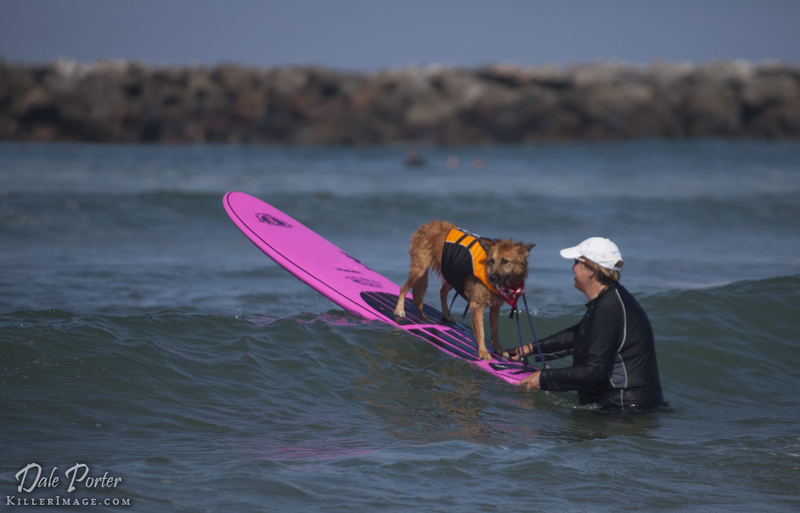 Photos below show So Cal Surf Dog Owners putting CFDs on their Surf Dogs. What the heck is a SDR? Your SDR is your 'Surf Dog Retriever'. This is your Wing-man (or Wing-woman) who will help you in the water. They will stay on the inside and watch your surf dog. After you push your Surf Dog into a wave, He/she is going help retrieve him and quickly get your Surf Dog back onto the surfboard and turned back out towards you. In a Surf Dog Competition this is extremely helpful. Since safety is always a priority, discuss with your SDRs [Surf Dog Retriever(s)] what you will be doing and what you expect of them before you head out into the surf. O.K! It's time to hit it! I always use the expression “Let’s go surfing” or "Do you want to go surfing?” before we head down to the water. You want them to be excited about surfing! You can use any expression that get’s them motivated! Grab your board and head down into the water. If you've prepared properly, your surf dog is running behind you, nosing you into the water! ALWAYS, Always point the nose (front of the surfboard) out towards the breaking surf or towards the beach! Never, ever parallel or sideways to the waves. A Surfboard that is sitting parallel to an approaching wave or soup is a dangerous projectile. The wave will pick up the surfboard and hurl it at you, your Surf Dog and who ever is standing next to you. It will hit you, knock you down, and quite possibly injure you and/or all three of you. If a surfboard is parallel or sideways to the soup, immediately turn it towards the oncoming surf or towards the beach. If you choose towards the surf, hold and push down the tail (back of the surfboard) so the nose of the surfboard goes up over the wave. If you choose towards the beach, hold the back of the surfboard and either lift it up over the wave or hold tight as the wave goes over or around you. 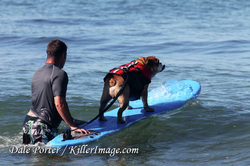 If you have a leash tied to the back of the surfboard that is not attached to your dog, you can try holding on to it. If you don’t do any of these in time, there’s a good chase you will be watching your surfboard go all the way to the beach. Move to one side or the other of the approaching surfboard and grab the nose or tail as it goes by. Let the wave swing the other end around. Straighten out the surfboard and push it back out towards the owner or the surf dog. If the Surf Dog is Swimming near by, help him up onto the surfboard first and then push both back out towards the owner. Helping each other in the water is not only good Etiquette but good Karma! Drop your surfboard in shin or knee deep water. As discussed in Chapter 6, Dog Meets Board and Water, give your Surf Dog the ‘UP’ command or what ever command you have used in practice. Here’s where all that practice pushing your Surf Dog thru the water the same way pays off! He knows what you expect of him and he knows what to do! Many dogs have this natural tenancy or desire to run to the front of the surfboard. When they do, the surfboard will pearl. (Pearl or Pearling is what happens when the nose of the surfboard goes under water which in turn brings the surfboard to a halt and catapults your dog into the drink!) Many run off the front of the surfboard because the are afraid and want nothing to do with this new 'thing'. The SoCal Surf Dogs have in the past suggested this as a training tool that you could try on a few waves with your dog leashed to the back of the surfboard. We no longer support this method. Although we have never seen a dog hurt doing this, we have seen dogs get all tangled up in their leash. If your dog continually runs to the front of the surfboard, they may be telling you they do not want to surf. Now that said, there are a few things you can try before you give up. Try is to surf them backwards. Turn them around on the surfboard so they are facing the tail of the surfboard and surf a couple of wave backwards. Then try surfing them forward again. We have had some success with this technique. You can also try surfing on the surfboard with them. You can also try working on a command at home to encourage them to get into the correct position (back 1/3 of surfboard) and to stay there. Some use the word 'Position' and when their dog is in the correct location, give them a treat. Patient and praise are required and my need to be repeated over a period of time before you head back to the beach. If you insist on leashing your dog to the surfboard, NEVER EVER attach the leash to their collar. Attach one end to the surfboard and one to the clip on the life jacket! A few more Important Notes! 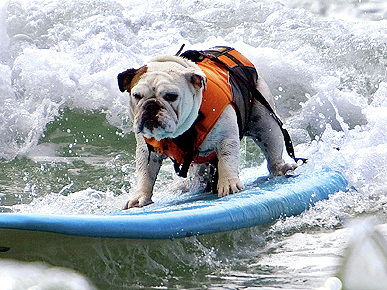 Dogs cannot steer or turn their surfboards. Yes they can learn to adjust their weight while surfing to stay in a wave, but they can’t turn! If you are pushing your dog out or you are on your way in to retrieve your Surf Dog, It’s YOUR RESPONSIBILITY to watch out for and stay out of the way of ALL SURFING DOGS!!! Make sure your SDRs understand this as well! Yell "Dog On" when after you have launched your dog and someone is in the way. If you hear "Dog On" get out of the way! DUH! 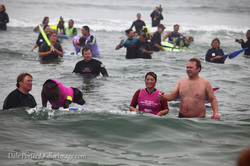 At Surf Dog Competitions it will get really crowded in the water. 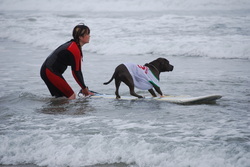 In all the excitement, it's easy to forget that there are other dogs surfing here to! Can't tell you how many times I've seen a Surf Dog getting a great ride only to run into the backs of people not paying attention to what is going on! BE AWARE AT ALL TIMES as to what's going on around you! SURFING DOGS HAVE THE RIGHT OF WAY!!! Let them enjoy the Stoke! "NOT PAYING ATTENTION TO WHAT'S GOING ON AROUND THEM"!!! In the first video, a Surf Dog runs over a fellow competitor! In the second video, a surf dog runs right into the back of someone not paying attention! You need to know how to turn a surfboard! It’s important to note that in order to turn a surfboard, the weight needs to be over one end or the other of the board. Typically it’s the tail. 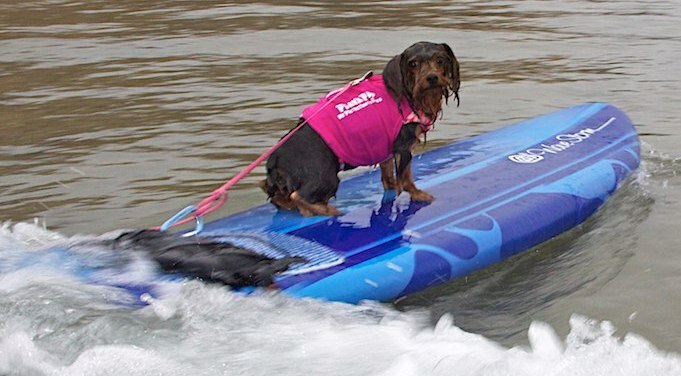 Your Surf Dog should already be in the back 1/3 of the surfboard. You should already be hold the tail of the surfboard with one hand and your Surf Dog with the other! You pivot the surfboard like a cork by lowering the tail slightly and raising the nose. You then just spin around. Try it! Then try turning the board without lowering one end or the other. Turning the surfboard is much easier if you are already holding onto the tail! Note how Doug has one hand on the rail and one on or near the tail. He is ready to turn Dozer and the surfboard around at a moments notice! Now your ready to turn quickly when you spot that awesome wave approaching! Your Surf Dog should always be standing. Going out, going over waves, turning around and surfing! Their feet will act as shock absorbers as they go over the waves. This not only gives them a lot of practice balancing on the surfboard on the way out, but they are also already in position and ready to go when a wave comes. By standing all the time, he his learning to balance and adjust his stance all the time. This will be huge when it's time to surf! Your Surf Dog is on the surfboard and you are pointed out towards the surf. Now you need to start pushing them out through the waves. The first time you do this it might be you and a friend or two helping. Too many helpers can freak a dog out. Remember, Lots of praise and make it fun. Eventually you’re going to want to be able to surf alone with your Surf Dog. Nothing is more fun than this! There’s really only a couple of ways to head out correctly. Pushing out nose first or paddling out with you and your dog on the board. 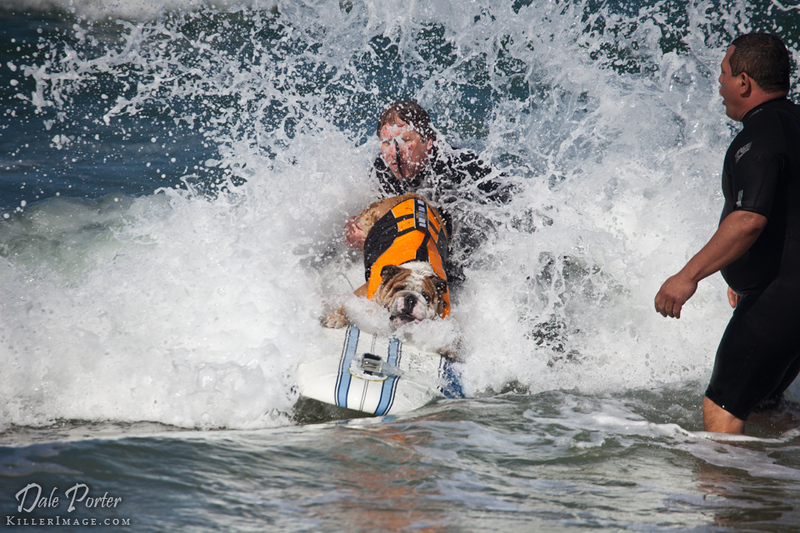 This is the easiest and best way to push your dog out into the surf. You and your helpers are walking behind your surf Dog at about the back 1/3 of the surfboard. You have one hand on the tail of the surfboard to control and push the surfboard and one hand on your surf dog when necessary. We call this position 'The SoCal Motorboat'. 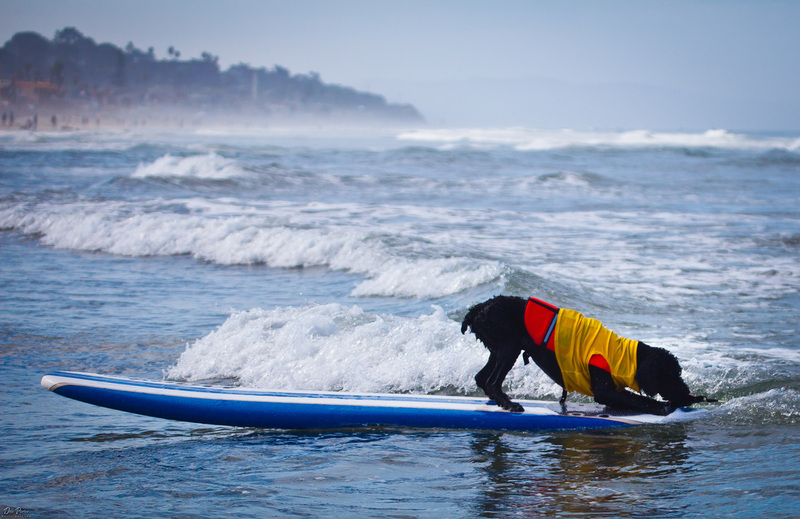 The SoCal Surf Dogs developed this technique after years of practicing and competing. You would never put the outboard motor on the side or front of a boat, so why would you want to hold the side or front of the surfboard? Always be in the back of the surfboard with one hand ready to hold the dog when necessary. This is where all the control is! As a wave or the soup approaches, you can push down on the tail of the surfboard so you can effortlessly go over the wave. 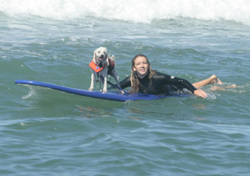 With your other hand and or arm, you are securing your dog so they are not knocked off the surfboard. You can hold the handle on the CFD in small waves. On larger waves or you can place your arm under their stomach or over their back with hand on their stomach and secure them close to you. You will all go over together. Remember, lots of praise! This is really different experience for a dog! If the waves are too big to use any of these techniques, maybe you should go or stay inside! While you are in this position, you can see everything that’s going on around you. You can see the approaching waves and any Surfing Dogs or loose surfboards that are coming towards you. This gives you time to get out of the way! If you’re using a larger surfboard to surf your dog or you want to tandem surf, you can climb on behind your dog to paddle out. If you already surf this isn’t difficult. If you have never surfed, this will take some practice. To get the feeling, you might try paddling around by yourself a few times first. Again, as the wave or soup approaches, lower the tail to raise the nose, hold on to the rails and go over the wave. This is not a good idea and it's dangerous. Never turn your back on the Ocean! Ever! This is the person the Lifeguards will be watching! One. You’re not next to your dog to steady them as you go through waves. Two. Your Surf Dog wants to be with you and will start to walk up towards you and the nose of the surfboard. Remember, you want them to be in the back 1/3 of the board. Three. You will need to reposition yourself to get ready to push you surf dog into a wave. You want to be able to turn quickly when a good wave approaches! Four. This is the most important reasons not to do this. You can’t see what’s going on behind you! You can’t see approaching waves. You can’t see the Surf Dogs that might be surfing right towards you. You can't see loose surfboards that may be heading directly towards you. Again, you NEVER want to turn your back on the ocean! I can’t tell you how many times I’ve seen this fool who promotes this, getting his dog washed off the surfboard. Just plain foolish! Don’t do it! and it slapped me good! Poor Tyson got swept off the board! Deb is doing it right! She's got in the back with full control of the surfboard and Kona. She can see the waves and any surfing dogs coming towards her!